We all know that the classic Maya temple was a place of religious ritual. But these structures must also have been pretty handy during times of conflict (most times). From the top of the large temple at Coba, which is 42 meters (138 feet, or about 12-14 stories) high, you can see quite a distance — under favorable conditions all the way to Ek Balaam, I think. 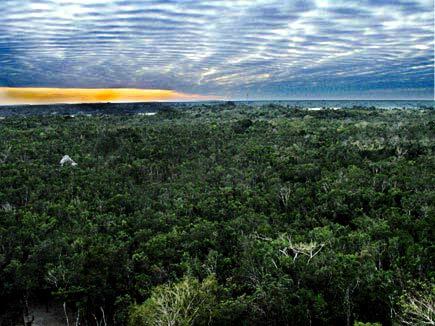 In this image you can see a structure from the central Coba group, which I think is called the Castillo, in the middle distance at the left, and the lakes of Coba (right) and Macanxoc (left) just below the horizon line. The five lakes of Coba are a very unusual feature in the Yucatan.